Here are the Those Were The Days lyrics. This is nostalgic and very singable - the perfect song for around the campfire! And sure to have our way. This song first became a hit in North America 'way back in 1968, and it was an old song even then. The music was written around 1918 by a Russian named Boris Fomin. That's what accounts for the addictively hummable klezmer-type tune. It sounds Russian, doesn't it? Fomin's song was called "Dorogoi Dlinnoyu", which loosely translates as "By the Long Road". It used words from a poem written by a man named Konstantin Podrevskii. The song was recorded in Russia a couple of times in the 1920s. In the early 1960s, an American named Gene Raskin borrowed the tune, wrote English lyrics, and called the song "Those Were The Days". Then, in 1968, Paul McCartney produced a recording of a Welsh singer named Mary Hopkins singing the song. It became an instant hit, making the "Top 10" lists in both the United States and Britain. It was recorded in Spanish, German, Italian and French at about the same time, and has been released in countless languages since - everything from Vietnamese to Greek to Portuguese. It is still being covered by new artists all the time, and is instantly recognizable to many of us. This is a great campfire song for the whole family. The adults can sing the complete Those Were The Days lyrics, and the kids can chime in with the "La la la la la la"s.
By the way, don't confuse this song with the theme song from the TV show "All in the Family"! They are two very different songs that happen to have the same name. Now that you have the Those Were The Days lyrics, click here to find the words to more classic songs to sing around the campfire. Planning a camping trip? 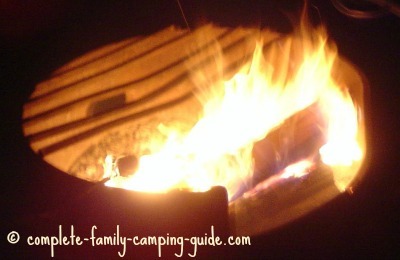 Visit the Complete Family Camping Guide home page for help with everything you need to know!